The Good Life Elsewhere is a fun, crazy novel which is a joy to read. It’s a book which, in its portrayal of a country in decline (and on the move), swings between side-splitting humour, poignant pathos and macabre violence. A sample? Now that’s a sentence worthy of starting any anecdote… And it’s not just the people of Mingir that want out; the list of would-be emigrants stretches across geographical and socio-economic boundaries. Even the President, dreaming of life as an assistant pizza cook, wants to leave Moldova behind for good. The destination of choice is Italy, the promised land of wine, pasta and low-paid cleaning jobs, and Serafim, who has dreamt of Italy for decades, is one of the most determined of the villagers. In preparation for his trip, he has even learnt Italian from a book, although (unfortunately) his language skills are not all they might be. Still, the problem of actually getting to the promised land remains, and it is in the inventive methods of circumventing the border guards that Lorchenkov excels. There are three main strands to the book, interspersed with various tales of gallows humour from elsewhere in Moldova. In the first, Serafim and his friend Vasily Lungu try to escape using Lungu’s tractor. It may not seem like the most useful of escape vehicles, but the two friends are rather inventive when it comes to making the most of their materials. Meanwhile, the local priest, seeking to catch up with the wife who abandoned him, decides to invade Italy, taking hundreds of thousands of Moldovans with him. A holy crusade with Italy as its destination? Why not? “Italy!” answered the villagers, in unison. The novel contains elements of magical realism, stretching the fabric of credibility, but there’s a stark truth behind the slapstick humour. Moldova is a poor country where the people are desperate to escape their hopeless lives and make a new start in the west. In fact, ‘Italy’ (which several people claim doesn’t really exist) is merely a state of happiness, not a place, and what the Moldovans are looking for may be something which is unattainable on earth. Still, if only the people could start looking for it in their own backyards, they might just be that little bit happier. Sadly, those heretics who dispute the glory of the heavenly Italian realm are not suffered gladly. 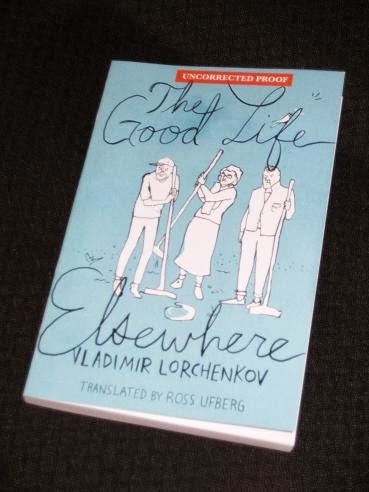 The Good Life Elsewhere contains several brutal stories, with some of the villagers burnt at the stake, or dismembered, simply for making other people uncomfortable. There’s just no future in denying the claim that Italy is the paradise Moldovans are waiting for, a disturbing take on the importance of having a dream. Guy – Well, great minds obviously think alike – Michael Orthofer, over at 'The Complete Review', also reviewed this today (and also liked it!). I'm due to receive a copy of the French translation (will come out in April, also from a small new publisher), and I'm excited to see that opinions on the English version of the book are so positive so far. Let's see whether I too will qualify as a great mind on this one. This sounds wonderful! Absolutely wonderful. From your description it reminds me a bit of the various NYRB Classics I've read, those that alternate between hysterical-funny and hysterical-tragic–and sometimes manage both variations at once. So glad I read this review!